in meteorology, an area of low pressure (i.e. a low); usually applies to a particular stage in the development of a cyclone. a kind of hoarfrost; ice crystals that develop by sublimation within a layer of dry snow; characterized by rapid recrystallization, usually caused by large temperature gradients; similar in physical origin to crevasse hoar; crystals are faceted, rather than rounded. the maximum thickness of the seasonally frozen layer. vertical interval between the top surface of a snow layer and the ground beneath; the layer is assumed to be evenly spread over the ground which it covers. the minimum distance between the ground surface and frozen ground at any time during the thawing season in an area subject to seasonal freezing and thawing. the distance from the ground surface downward to the level beneath which there is practically no annual fluctuation in ground temperature. crack or fissure developed in fine-grained soil material as a result of shrinkage during drying. closed, multi-sided, patterned ground feature formed by desiccation cracks in fine-grained soil material, usually less than 2 meters (6.6 feet) in diameter. (1) (North American usage) the mean of the three largest depths of seasonal frost penetration measured during the past thirty years, or the largest depth of seasonal frost penetration beneath a snow-free soil surface measured during the past ten years (2) (Russian usage) the mean of the depths of seasonal frost penetration measured during at least the last ten years with the ground surface free of snow and the groundwater level below the depth of seasonal frost penetration. the cumulative number of degree-days below 0 degrees Celsius, calculated by taking the average of the seasonal freezing indices for the three coldest winters in the most recent 30 years of record. the cumulative number of degree-days above 0 degrees Celsius, calculated by taking the average of the seasonal thawing indices for the three warmest summers in the most recent 30 years of record. snow metamorphism that rounds the comers and edges of an ice crystal. a slope failure in which the thawed or thawing portion of the active layer detaches from the underlying frozen material. the temperature to which a given parcel of air must be cooled at constant pressure and constant water-vapor content in order for saturation to occur; when this temperature is below 0 degrees Celsius, it is called the frost point. a type of precipitation composed of slowly falling, very small, unbranched crystals of ice which often seem to float in the air; it may fall from a high cloud or from a cloudless sky, it usually occurs under frosty weather conditions (under very low air temperatures). measure of the ability of the soil to store electrical energy in the presence of an electrostatic field. a tensile fracture in a frozen material due to surface extension caused by doming. ice that forms in dilation cracks. either of the two points on the earth's surface at which magnetic meridians converge; the horizontal component of the magnetic field of the earth becomes zero at this point; also called the magnetic pole. An Arctic atmospheric pressure pattern characterized by high pressure centered over the northern Beaufort Sea and unusually low pressure centered over the Kara Sea. This pattern contributes to ice loss in summer, causing winds to blow ice away from the coast. a cone-shaped formation of ice that is covered by dirt; a dirt cone is caused by a differential pattern of ablation between the dirt covered surface and bare ice. ice that contains sediments stirred up and tangled in the ice as it grows. permafrost occurring in some areas beneath the exposed land surface throughout a geographic region where other areas are free of permafrost. 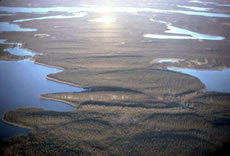 the major subdivision of a permafrost region in which permafrost occurs in some areas beneath the exposed land surface, whereas other areas are free of permafrost. permafrost that is not in thermal equilibrium with the existing mean annual surface or sea-bottom temperature and the geothermal heat flux. preferred path for meltwater to flow from the surface through a snow cover. a semipermanent mass of firn formed by drifted snow behind obstructions or in the ground; also called a catchment glacier or a snowdrift glacier. ice that moves from winds, currents, or other forces. 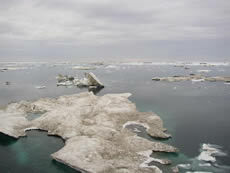 displacement of a sea ice field from its place of origin under the effect of ocean currents and winds. floating (or drifting on ice) ocean buoy equipped with meteorological and/or oceanographic sensing instruments linked to transmitting equipment for sending the observed data to collecting centers. snow raised from the surface of the earth by the wind to a height of less than 1.5 to 2.0 meters (5 to 6.6 feet) above the surface; it dose not restrict horizontal visibility at 2 meters (6.6 feet) or more above the surface. research stations on the floes of the arctic ocean. remnant elongated hills formed by historical glacial action; it is not clear exactly how they are formed and why they form only in some glaciated regions. trees leaning in random directions caused by melting permafrost. the mass of a unit volume of dried material (e.g. soil).